A stroke is a medical emergency that may also be associated with a headache. Let's read about the types of stroke and how a stroke-related headache may be distinguished from a benign primary headache. Strokes occur when blood flow to the brain is interrupted. There are two types of strokes. An ischemic stroke occurs when an artery that supplies oxygen-rich blood to the brain becomes blocked, causing brain cell death due to lack of blood flow. A hemorrhagic stroke occurs when an artery in the brain bursts, and there is bleeding into the brain. A common example of a hemorrhagic stroke is a subarachnoid hemorrhage. In this condition, a severe headache is the only symptom in about a third of the patients. Both types of strokes are medical emergencies, and both may be associated with a headache. According to a 2010 study from Italy, between 7 percent and 65 percent of stroke patients will report some sort of precipitating headache. The focal point of a headache may depend on where the stroke is occurring. For instance, strokes that arise within the carotid artery (a major artery in the neck that brings blood to the brain) may produce a headache in the forehead. Strokes in the vertebrobasilar system, which supplies blood to the back of the brain, may produce a headache at the back of the head. People will often describe a stroke headache as the "worst of my life" or say that it appeared like a "thunderclap" without warning. The pain generally won't be throbbing or develop gradually like a migraine. Rather, it will hit hard and fast. 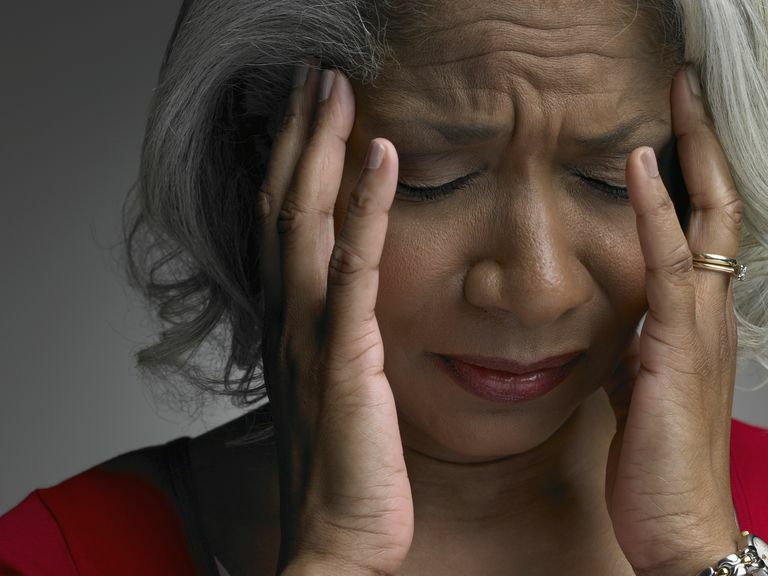 When compared to a migraine, a stroke headache is associated with the loss of sensation (such as feeling or vision). By contrast, a migraine is characterized by the emergence of sensations (such as auras, flashing lights, or tingling skin). A kind of stroke often mistaken for a migraine is a transient ischemic attack (TIA), also called a "mini-stroke because the obstruction of blood flow is only temporary. Symptoms of a TIA are less severe but often take a long time to recover certain muscle movements, like making a tight fist or keeping steady one's feet. Although it is not as dangerous as a stroke, a TIA is often an early warning sign of a full stroke. Seek help irrespective how severe the symptoms may be. If you believe you are experiencing symptoms of a stroke, call 911. Early treatment is the key to preventing any long-term effects from a stroke. This is especially true if a severe headache hit suddenly and is unlike anything you've experienced before. Even if the symptoms are uncertain, seek emergency care if you have an underlying risk for a stroke, including high blood pressure, heart disease, a family history of strokes, diabetes, smoking, a diagnosed brain aneurysm, or are over 60. Carolei A & Sacco S. Headache Attributed to Stroke, TIA, Intracerebral Haemorrhage or Vascular Malformation. Handb Clin Neurol. 2010;97:517-28. "Headache: Hope Through Research.” From the National Institute of Neurologic Disorders and Stroke website. Vestergaard K, Andersen G, Nielsen MI, & Jensen TS. Headache in Stroke. Stroke. 1993 Nov;24(11):1621-4.